On April 4, 1967, exactly one year before his assassination, Martin Luther King Jr stepped up to the lectern at the Riverside Church in Manhattan. The United States had been in active combat in Vietnam for two years, and tens of thousands of people had been killed, including some 10,000 US troops. The political establishment — from left to right — backed the war, and more than 400,000 US service members were in Vietnam, their lives on the line. It was a lonely, moral stance. And it cost him. But it set an example of what is required of us if we are to honour our deepest values in times of crisis, even when silence would better serve our personal interests or the communities and causes we hold most dear. It’s what I think about when I go over the excuses and rationalisations that have kept me largely silent on one of the great moral challenges of our time: the crisis in Israel-Palestine. I have not been alone. Until very recently, the entire Congress has remained mostly silent on the human rights nightmare that has unfolded in the occupied territories. Our [America’s] elected representatives, who operate in a political environment where Israel’s political lobby holds well-documented power, have consistently minimised and deflected criticism of the state of Israel, even as it has grown more emboldened in its occupation of Palestinian territory and adopted some practices reminiscent of apartheid in South Africa and Jim Crow segregation in the United States. Many civil rights activists and organisations have remained silent, as well, not because they lack concern or sympathy for the Palestinian people, but because they fear loss of funding from foundations and false charges of anti-Semitism. They worry, as I once did, that their important social justice work will be compromised or discredited by smear campaigns. Similarly, many students are fearful of expressing support for Palestinian rights because of the McCarthyite tactics of secret organisations like Canary Mission, which blacklists those who publicly dare to support boycotts against Israel, jeopardising their employment prospects and future careers. Reading King’s speech at Riverside more than 50 years later, I am left with little doubt that his teachings and message require us to speak out passionately about the human rights crisis in Israel-Palestine, despite the risks and despite the complexity of the issues. Many students are fearful of expressing support for Palestinian rights because of the McCarthyite tactics of secret organisations like Canary Mission, which blacklists those who publicly dare to support boycotts against Israel, jeopardising their employment prospects and future careers. - Michelle Alexander, American writer, civil rights advocate, and visiting professor at Union Theological Seminary. King argued, when speaking of Vietnam, that even “when the issues at hand seem as perplexing as they often do in the case of this dreadful conflict,” we must not be mesmerised by uncertainty. 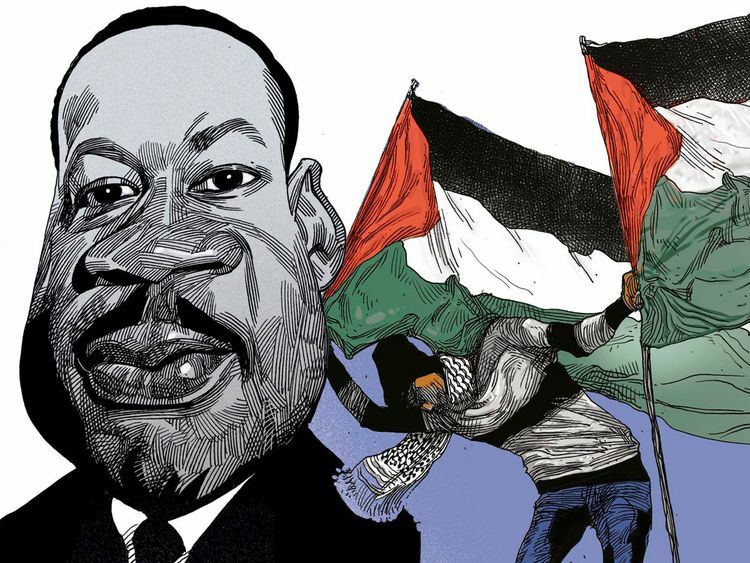 And so, if we are to honour King’s message and not merely the man, we must condemn Israel’s actions: unrelenting violations of international law, continued occupation of the West Bank, East Jerusalem and Gaza, home demolitions and land confiscations. We must cry out at the treatment of Palestinians at checkpoints, the routine searches of their homes and restrictions on their movements, and the severely limited access to decent housing, schools, food, hospitals and water that many of them face. We must not tolerate Israel’s refusal even to discuss the right of Palestinian refugees to return to their homes, as prescribed by United Nations resolutions, and we ought to question the US government funds that have supported multiple hostilities and thousands of civilian casualties in Gaza, as well as the $38 billion (Dh139.5 billion) the US government has pledged in military support to Israel. And finally, we must, with as much courage and conviction as we can muster, speak out against the system of legal discrimination that exists inside Israel, a system complete with, according to Adalah, the Legal Centre for Arab Minority Rights in Israel, more than 50 laws that discriminate against Palestinians — such as the new nation-state law that says explicitly that only Jewish Israelis have the right of self-determination in Israel, ignoring the rights of the Arab minority that makes up 21 per cent of the population. Of course, there will be those who say that we can’t know for sure what King would do or say today regarding Israel-Palestine. That is true. The evidence regarding King’s views on Israel is complicated and contradictory. Although the Student Nonviolent Coordinating Committee denounced Israel’s actions against Palestinians, King found himself conflicted. Like many black leaders of the time, he recognised European Jewry as a persecuted, oppressed and homeless people striving to build a nation of their own, and he wanted to show solidarity with the Jewish community, which had been a critically important ally in the civil rights movement. There was no way King (Martin Luther King Jr) could publicly reconcile his commitment to non-violence and justice for all people, everywhere, with what had transpired after the 1967 war. He continued to support Israel’s right to exist, but also said on national television that it would be necessary for Israel to return parts of its conquered territory to achieve true peace and security and to avoid exacerbating the conflict. There was no way King could publicly reconcile his commitment to non-violence and justice for all people, everywhere, with what had transpired after the 1967 war. Today, we can only speculate about where King would stand. Indeed, King’s views may have evolved alongside many other spiritually-grounded thinkers, like Rabbi Brian Walt, who has spoken publicly about the reasons he abandoned his faith in what he viewed as political Zionism. He said he grew up in South Africa in a family that shared those views and identified as a liberal Zionist. The time he spent in the occupied territories, visiting more than 20 times, forever changed him. He told me that he watched Palestinian homes being bulldozed while people cried — children’s toys strewn over one demolished site — and saw Palestinian lands confiscated to make way for new illegal colonies subsidised by the Israeli government. He came to see that these demolitions, colonies and acts of violent dispossession were not rogue moves, but fully supported and enabled by the Israeli military. For him, the turning point was witnessing legalised discrimination against Palestinians, including streets for Jews only, which, he said, was worse in some ways than what he had witnessed as a boy in South Africa. Growing numbers of people of all faiths and backgrounds have spoken out with more boldness and courage. American organisations such as If Not Now support young American Jews as they struggle to break the deadly silence that still exists among too many people regarding the occupation, and hundreds of secular and faith-based groups have joined the US Campaign for Palestinian Rights. In view of these developments, it seems the days when critiques of Zionism and the actions of the state of Israel can be written off as anti-Semitism are coming to an end. There seems to be increased understanding that criticism of the policies and practices of the Israeli government is not, in itself, anti-Semitic. This is not to say that anti-Semitism is not real. Neo-Nazism is resurging in Germany within a growing anti-immigrant movement. Anti-Semitic incidents in the United States rose 57 per cent in 2017, and many of us are still mourning what is believed to be the deadliest attack on Jewish people in US history. We must be mindful in this climate that, while criticism of Israel is not inherently anti-Semitic, it can slide there. Fortunately, people like the Rev Dr William J. Barber II are leading by example, pledging allegiance to the fight against anti-Semitism while also demonstrating unwavering solidarity with the Palestinian people struggling to survive under Israeli occupation. He declared in a riveting speech last year that we cannot talk about justice without addressing the displacement of native peoples, the systemic racism of colonialism and the injustice of government repression. Guided by this kind of moral clarity, faith groups are taking action. In 2016, the pension board of the United Methodist Church excluded from its multibillion-dollar pension fund Israeli banks whose loans for colony construction violate international law. Similarly, the United Church of Christ the year before passed a resolution calling for divestments and boycotts of companies that profit from Israel’s occupation of Palestinian territories. Even in Congress, change is on the horizon. For the first time, sitting members, publicly support the boycott, divestment and sanctions movement. In 2017, Representative Betty McCollum, Democrat-Minnessota, introduced a resolution to ensure that no US military aid went to support Israel’s juvenile military detention system. Israel regularly prosecutes Palestinian children detainees in the occupied territories in military court. Even in Congress, change is on the horizon. For the first time, sitting members, publicly support the boycott, divestment and sanctions movement. In 2017, Representative Betty McCollum, Democrat-Minnessota, introduced a resolution to ensure that no US military aid went to support Israel’s juvenile military detention system. Israel regularly prosecutes Palestinian children detainees in the occupied territories in military court. None of this is to say that the tide has turned entirely or that retaliation has ceased against those who express strong support for Palestinian rights. To the contrary, just as King received fierce, overwhelming criticism for his speech condemning the Vietnam War — 168 major newspapers, including The Times, denounced the address the following day — those who speak publicly in support of the liberation of the Palestinian people still risk condemnation and backlash. In November, Marc Lamont Hill was fired from CNN for giving a speech in support of Palestinian rights that was grossly misinterpreted as expressing support for violence. Canary Mission continues to pose a serious threat to student activists. And just over a week ago, the Birmingham Civil Rights Institute in Alabama, apparently under pressure mainly from segments of the Jewish community and others, rescinded an honour it bestowed upon civil rights icon Angela Davis, who has been a vocal critic of Israel’s treatment of Palestinians and supports BDS. But that attack backfired. Within 48 hours, academics and activists had mobilised in response. The mayor of Birmingham, Randall Woodfin, as well as the Birmingham School Board and the City Council, expressed outrage at the institute’s decision. The council unanimously passed a resolution in Davis’ honour, and an alternative event is being organised to celebrate her decades-long commitment to liberation for all. I cannot say for certain that King would applaud Birmingham for its zealous defence of Angela Davis’ solidarity with Palestinian people. In this new year, I aim to speak with greater courage and conviction about injustices beyond our borders, particularly those that are funded by our [the American] government, and stand in solidarity with their struggles for democracy and freedom. My conscience leaves me no other choice. Michelle Alexander is a noted American writer, civil rights advocate, and visiting professor at Union Theological Seminary.